New world tournament reflects growing global appeal of National Team baseball events. LAUSANNE, Switzerland -- The president of the World Baseball Softball Confederation (WBSC), Riccardo Fraccari, announced today the launching of the new flagship men's National Team baseball event, The "Premier12" world championship, which will first be staged in November 2015 in Taiwan and feature the world's top-twelve ranked nations (The "Premier12"). The Premier12 will be held every four years and will become baseball's highest-ranked international competition. The Premier12 champion will be awarded baseball's largest prize of World Ranking bonus points. The WBSC will also guarantee prize money -- to be in the US$ millions -- among the National Teams/National Federations (NFs) participating in The Premier12 and will also cover their costs (e.g., air travel, accommodation, etc. ), with the players being treated to premium services and facilities. WBSC has elected to stage the inaugural Premier12 in November 2015, following the conclusion of many domestic league championships, to give the world's professional players the opportunity of uniting to represent their National Teams over 10-12 competition days. Not only has The Premier12 been positioned to avoid schedule conflicts with the world's professional baseball leagues, The Premier12 will take place at a time when Taiwan's climate should provide favorable performance conditions for the players/National Teams. 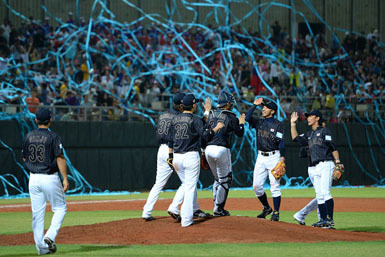 The WBSC will announce The Premier12's qualified National Teams later this year (in Nov.), after the final 2014 World Rankings have been calculated. Currently, WBSC's top twelve ranked countries in the world are No. 1 USA, No. 2 Japan, No. 3 Cuba, No. 4 Chinese Taipei, No. 5 Dominican Republic, No. 6 Netherlands, No. 7 Canada, No. 8 Korea, No. 9 Puerto Rico, No. 10 Venezuela, No. 11 Italy and No. 12 Mexico -- and only a few points separate Mexico from No. 13 Panama, No. 14 Australia and No. 15 Brazil. The Premier12's innovative use of the World Rankings as the sole qualification method is set to give a tremendous boost to the dynamics and the value of not only the World Rankings but also the already successful Youth Baseball World Cup platforms (U-12, U-15, U-18 and U-21), whose results are all connected to the rankings. Baseball's World Rankings (See World Rankings and methodology) are a reflection of a country's overall National Team programme, from Under-12 to professional level. As such, The Premier12 will act as the lead driver to cross-promote WBSC's new and interconnected baseball tournaments-framework. The guaranteed inclusion of the world's best-ranked countries in The Premier12 will ensure the highest possible level of competition and will position The Premier12 to generate maximum interest from players, NFs, spectators, media, sponsors and broadcasters. The Premier12 platform is being rolled out under President Fraccari in response to the demand from the players, WBSC's NFs and Associate Members, commercial partners and broadcasters. "The WBSC is thrilled to announce the groundbreaking addition of The Premier12 to WBSC's tournaments-structure," said President Fraccari. "The Premier12 will unite baseball's top nations and give baseball's best players in the world the opportunity -- and the highest honour -- to play for their countries on a global stage. "The Premier12 will be a worldwide spectacle that generates huge media numbers and will not only be very exciting but also very rewarding for the players, the NFs, the fans and for our partners, who have all driven demand for this new event." The blockbuster announcement of The Premier12 comes at a time when WBSC's National Team competitions are continuing to increase dramatically in terms of their popularity, global reach and market value -- and when WBSC, under President Fraccari, is seeking to strengthen the case for the inclusion of baseball/softball -- one of the most recognisable, commercially successful and biggest organised sports in the world -- in the Olympic Games. "The Premier12 underlines WBSC's commitment to further globalize and brand our National Team events," said President Fraccari, "and the commercial and broadcast power of The Premier12 is a concrete example that clearly demonstrates the assets WBSC, our NFs and our stakeholders can deliver to the Olympic Games." WBSC projects The Premier12 will generate a global broadcast reach that will extend to hundreds of millions homes and will be followed by millions of young mobile users through Premier12's multi-language online/digital platforms, which are under development and expected to be available -- at a minimum -- in three languages (i.e., English, Japanese and Spanish). Feasibility studies will be conducted on whether to expand The Premier12 online/digital platforms to include content in Korean and Chinese languages. There will be a total of 38 contests in the 2015 Premier12. The Premier12 National Teams will be split into two groups of six and begin the competition with a round-robin that will see each nation play five games (30 games in total). The top four nations from each group will advance to the next round, which begins the single-elimination knockout stages (quarterfinals, semifinals and gold-medal final). A bronze medal match will also be organised. The Premier12 will always be scheduled in the year preceding the Summer Olympic Games and could potentially serve as an Olympic qualifier, if included in the Olympics. The four-year cycle will also allow National Federations to map out their activity, develop their National Team brands, and formulate strategies to climb up the World Rankings ladder by competing in WBSC sanctioned competitions. The WBSC will reveal the "global" visual brand identity, including the new logo, for The Premier12 in the coming weeks.